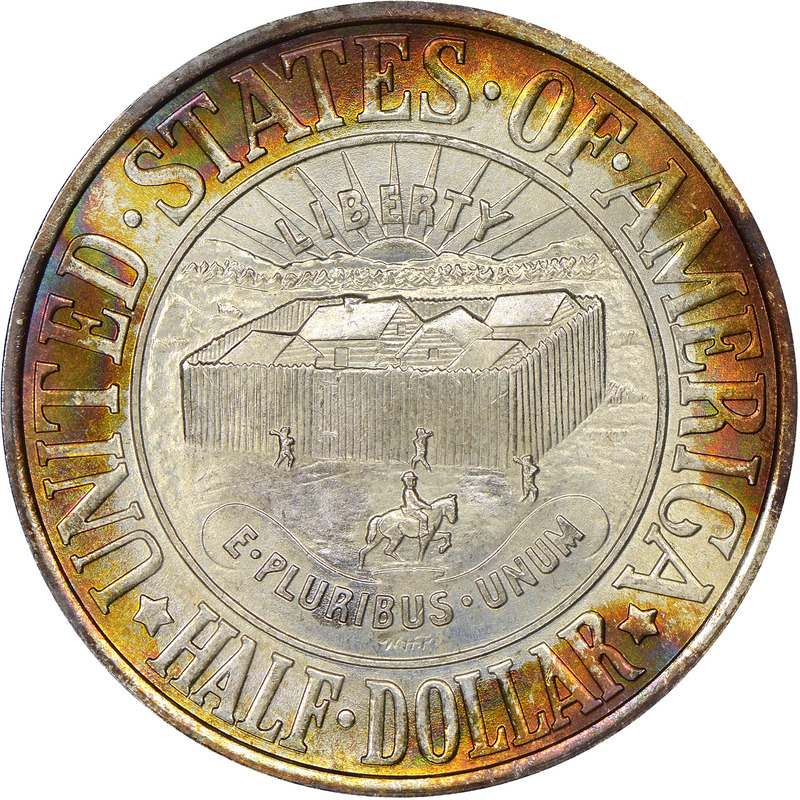 The 1936 York Tercentenary half dollar was another commemorative coin decried at the time of its issuance for its strictly local significance. 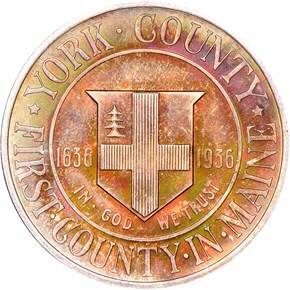 The coin was approved mostly due to the connections that the coin’s sponsors had, most notably numismatist Walter P. Nichols, who was Treasurer of the Committee for Commemoration of the Founding of York County. The sponsors were able to have a bill passed on June 26th, 1936 authorizing the mintage of up to 30,000 coins. 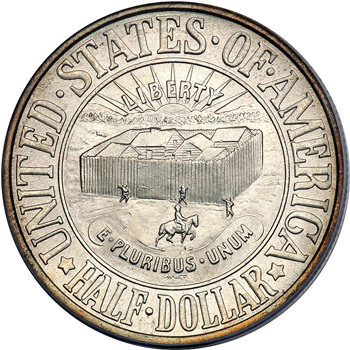 The Committee selected Portland, Mane artist Walter H. Rich to design the coin. 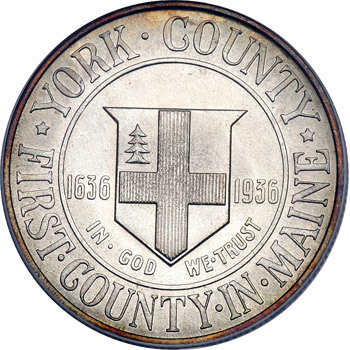 His obverse depicts the arms of York County. This includes a cross against a shield, with a pine tree in the upper left quadrant. The dates 1636 and 1936 flank the shield, while the statutory motto IN•GOD WE•TRUST appears below it, all enclosed within a circle. 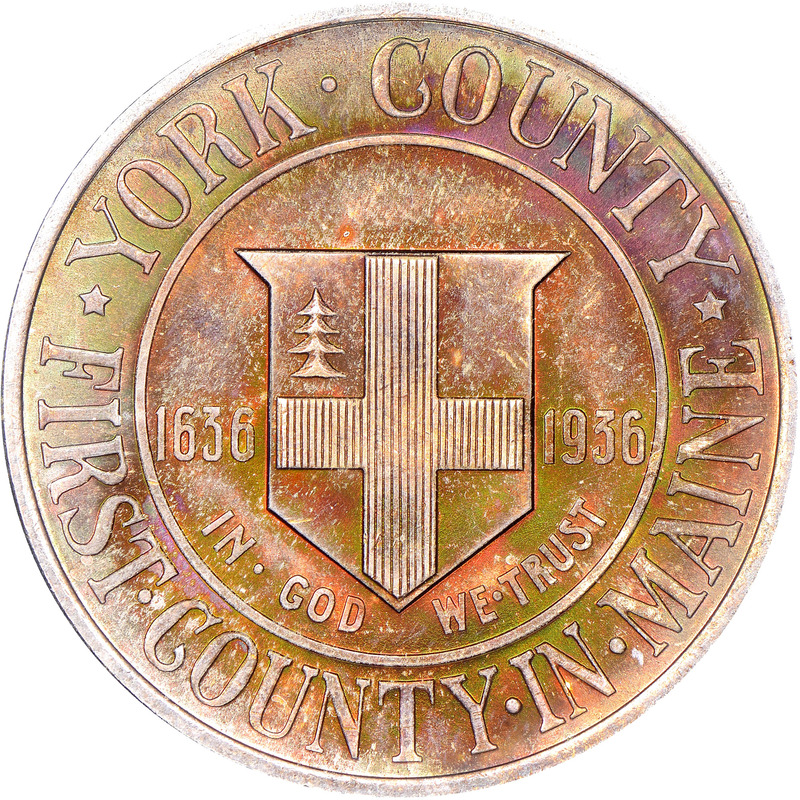 Arranged around the obverse periphery are the legends YORK•COUNTY and FIRST•COUNTY•IN• MAINE, separated by stars. The reverse of this type features a view of Brown’s Garrison (which was a fort around which York County was formed) with a rising sun behind it. The statutory mottoes LIBERTY and E•PLURIBUS•UNUM appear in the field above and below the garrison, respectively. Below the Latin motto are the designer’s script initials W.H.R. All of these elements are enclosed within a circle. Arranged around the periphery are the legends UNITED•STATES•OF•AMERICA and HALF•DOLLAR, the two separated by stars. In August of 1936, 25,000 of the 30,000 mintage limit were coined. Many were sold to Maine residents, and early sales were brisk. However, after the commemorative coin market collapsed in late 1936, sales slowed. The Commission held on to the remaining coins however, and they were sold in lots all the way through the 1950’s. This left a net mintage of 25,000 coins for the type.